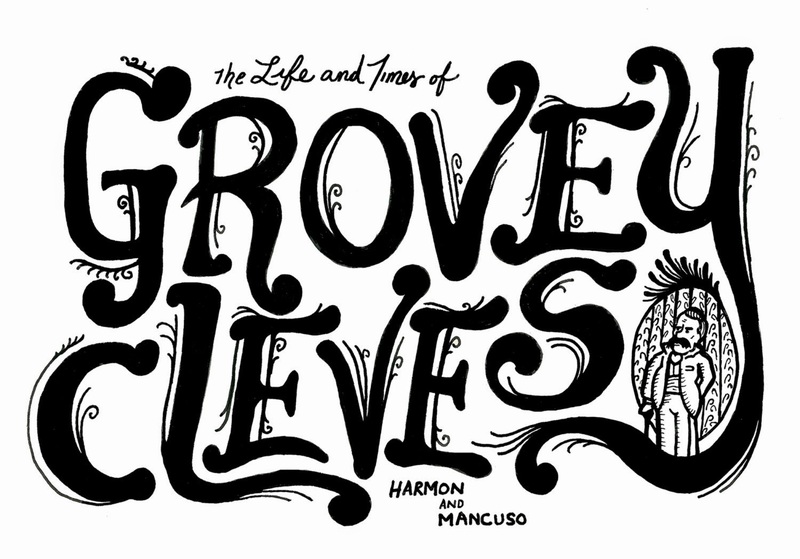 Grover Cleveland may seem like an odd choice for anything: a play, a movie, a song, an illustrated book of fiction, but for Scott Mancuso and Mickey Harmon the choice couldn’t be more appropriate. They both reside in Buffalo, New York, a place where the presence of Grover Cleveland is tangible. The former president has had all manner of things named after him, including a now defunct hospital, a park, a golf course, and a couple streets. There’s also a statue of the man at City Hall. But I would not classify The Life and Times of Grovey Cleves as a biography. In fact the book doesn’t appear to claim a genre, which adds to the mystery of just how much accurate history we're going to get, or how much we should expect. On the surface it does read like a children’s biography of the 22nd and 24th POTUS, but the writing, and as I’ll get to later, the art, builds toward something darker and more complex, often using levity. Cleveland's name for instance is changed to the funnier Grovey Cleves of the Caldwell, New Jersey Cleves (Cleveland's actual hometown). A consistent metaphor throughout the book refers to Grovey's light, which exists inside of him, is filled up by the sun, and is responsible for his drive and energy. This light serves as a way for Mancuso to negotiate Grovey's determination to become adored, known, and successful in his lifetime. Purchase The Life and Times of Grovey ClevesHERE. Free digital edition available HERE. Reviewer bio: Brian Mihok's work has appeared or is forthcoming in Rain Taxi, Everyday Genius, 1913, and Fast Company. His debut novel, The Quantum Manual of Style, was published by Aqueous Books in 2013. He is editor of matchbook, a literary journal of indeterminate prose, and associate editor at sunnyoutside press. He lives in New York City where he makes videos and takes pictures.